Join HOWL! 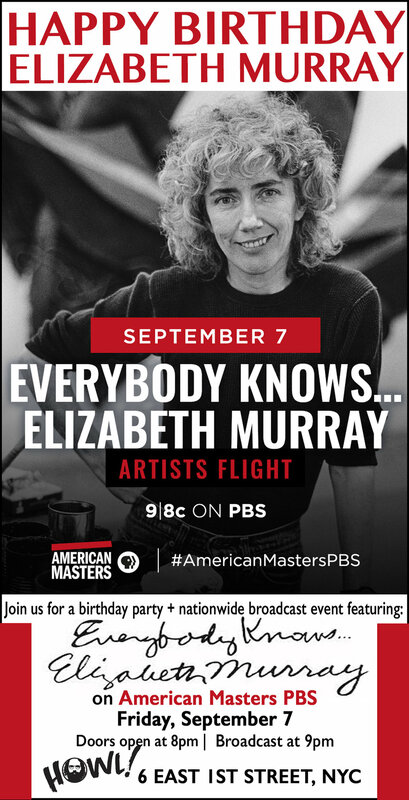 Arts, Inc. and the Estate of Elizabeth Murray for a birthday celebration and the official American Masters PBS nationwide broadcast event of “Everybody Knows… Elizabeth Murray.” Doors open at 8pm / broadcast begins at 9pm (Howl! Arts, 6 East 1st Street). Join us for cake and champagne on what would have been EM's 78th birthday! This intimate portrait of maverick painter and printmaker Elizabeth Murray explores the relationship between her family life and career, and reconsiders her place in contemporary art history. Excerpts from her journals voiced by Meryl Streep, verité footage and home videos show Murray’s internal struggles and incredible ambition. Exclusive interviews with art world luminaries describe the thriving New York art scene within which Murray challenged and captivated her viewers. In 2005, Murray was the fifth woman to be celebrated with a retrospective at the Museum of Modern Art. Breaking convention, Murray’s paintings still defy efforts at categorization. Through them she made an indelible imprint on the contemporary art world. This film chronicles her remarkable journey from an impoverished childhood in Chicago to the extraordinary art world of lower Manhattan, before she lost her life to cancer in 2007. American Masters: Everybody Knows…Elizabeth Murray cements Murray’s legacy as one of the great painters of our time. Directed and produced by Kristi Zea. The film will be broadcast nationwide on PBS Sept 7 at 9pm and in the NY metro-area on THIRTEEN. Four documentaries explore the lives of iconic visual artists Eva Hesse, Elizabeth Murray, Andrew Wyeth and Jean-Michel Basquiat / Uncovering the lives and works of four groundbreaking visual artists, American Masters presents an “Artists Flight” of new documentaries, premiering Fridays, August 31-September 14 on PBS (check local listings). Four films tell the stories of four artists: Eva Hesse, the 1960s art world icon who changed art history and women’s place in the picture; New York contemporary art maverick Elizabeth Murray; painter Andrew Wyeth, one of America’s most popular, but least understood, artists; and Jean-Michel Basquiat, the New York graffiti artist turned ’80s art world rock star who died 30 years ago (August 12, 1988). Each film will be available to stream the following day via pbs.org/americanmasters and PBS apps. “Week over week, each artist’s tremendous contributions to the medium will be explored. Combined, they create a rich canvas of modern art,” said Michael Kantor, executive producer of American Masters.